I would like to introduce you to my camel. Her name is Nadia. She's the cute one with the red saddle and the big brown eyes and long eyelashes. We are in Morocco for the day, and a trip to Africa is not complete (evidently) without a camel ride. They are very tall. It’s quite an experience to get on the “saddle”, which is built to fill in the humps, and have them lurch to their feet, which incorporates several levels. It's sort of like one of those fancy fold-up extension ladders. First to the knees in the back, then to the knees in the front, then to standing in the back, and......well, it's a pretty tipsy deal. But we manage, and now we're off for the big trek. The beautiful Mediterranean provides pretty spectacular backdrop for our camel ride along the beach. It's not very long, but that's OK. Turns out the seating is not all that comfy. And getting off is even bumpier than getting on. They made me put down my camera and use both hands to stay put while she folded her long legs into pretzels and landed on the ground. The baby’s were adorable, also very sweet. Wish I’d brought a sugar cube or something. I guess that’s for horses, though, right? What is it for camels? A carrot? No, that sounds like horses, too. Oh well. Sorry, maybe next time. And here's one for ya, Nadia. If you get tired of putting up with tourists, you might check with Google. I hear they are hiring. True story. This from an article, I think it was in US News & World Report (but you can Google it to be sure!) 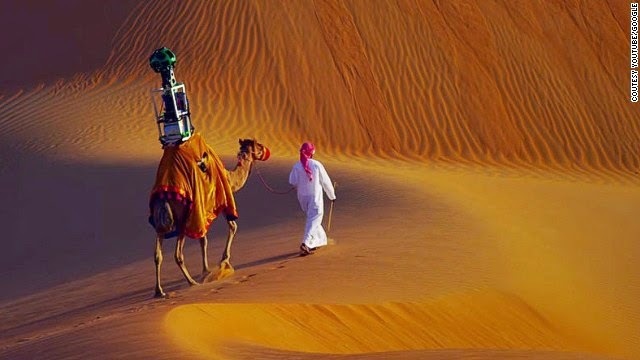 "Google recently photographed the Liwa Desert using a camel with a Street View camera strapped to it's back." We got a kick out of this. I have pictures of the Google cars in several of the countries we have visited, it's always interesting to me that they have been down little back alleys in Thailand or Japan or the Czech Republic. But this. This beats all. Ron & I are considering taking a trip with them but we can't go for a couple of years. Enjoy Spain and I know you would love what Wil & Brandi have to offer. Oh, Carol, thank you so much for this referral! One of the reasons we decided to take this day trip to Tangier was so we could get a feel for doing the real thing later on. Contacts like this are invaluable, I appreciate it so much. I will tuck this info away in my travel file! Thanks a bunch!